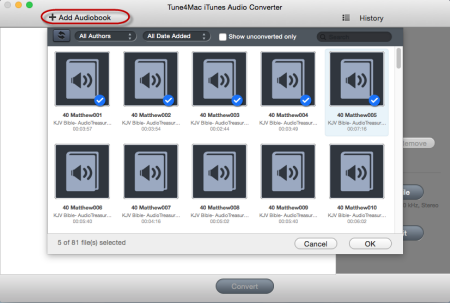 The list auto loads all playable audiobooks from the iTunes Books library. You can select the files you want to convert. 1. Support dragging aa, aax format to add external files and selected. 2. Support selecting the Authors and Date Added as Filter. 3. The Search keywords can be matched with the Name and Authors. Click Profile button and select the required profile in Output File Format drop list. After selection, the selected format will be set for all files on the list. Click the app menu and select Preferences to customize the Output Settings by clicking Choose… to set the destination. 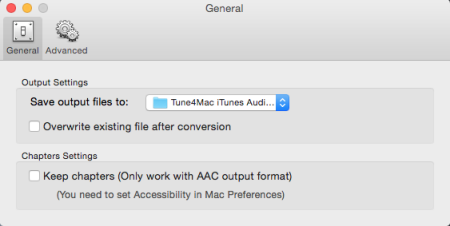 Tips: The default path is / Users/ user/ Documents/ App name, click Reveal In Finder could open the path. Click the Convert button and then the selected files will be listed in the window that pops up. When the conversion is started, the Status will keep updating the status of the files until that the conversion finished. 1. Click the Stop icon to stop the current converting, or click the Stop button to stop all files converting. 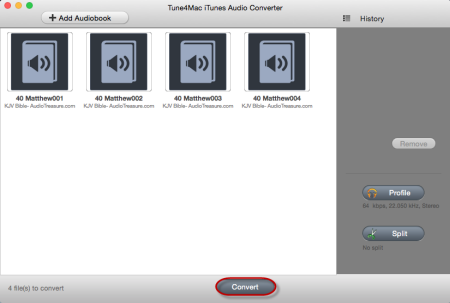 Warning: Please don't do anything with iTunes during converting.